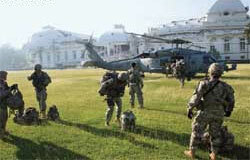 US troops landed on the lawns of Haiti’s shattered Presidential Palace on January 19 purportedly to help the country rebuild after the earthquake and control looting and violence that hampered distribution of aid. The 7.0-quake struck the Caribbean country on January 12, killing an estimated 200,000 people (See Also: The world the slaves built ). As the UN eased sanctions on timber trade in Liberia, the government is considering a forestry law to encourage logging companies by reducing taxes, increasing concessions and abolishing bidding process for the tropical rainforest. The timber industry had fuelled civil conflict in the 1990s. Kenya reclaimed 60,000 ha of Mau forest from illegal settlers and planted 20,000 seedlings to save the region’s largest water catchment area. Occupants that remain in the forest have title deeds allotted by the previous government. Uganda’s blood bank has run dry following a surge in malaria cases across the country, said the Uganda Blood Transfusion Service. China became the first country to allow commercial cultivation of GM rice. Developed by Chinese scientists, the Huahui 1 and Bt Shanyou 63 varieties will be ready for sale in two years. Green groups are worried as China is a major exporter of the staple. Bangkok is sinking 2-5 cm a year due to subsidence and poor urban planning, said Thai researchers. With added problems of rising sea levels due to global warming, the city would grapple with 2m high flood waters by 2050, they warned. Abu Dhabi is working on a hydrogen power plant and a carbon capture and storage project that would split natural gas into hydrogen and CO2. Hydrogen would fire a 500 MW power plant and CO2 would be injected into oilfields to boost output. The plant, first of its type, will be ready by 2014. ccs is an unproven technology. Iran has beefed up security measures to protect its nuclear experts after a top atomic scientist was killed in a bombing in Tehran in mid-January. Officials accused cia and Mossad, intelligence agencies of usa and Israel, of playing a hand in the murder. Researchers from South-east Asia met to map out poultry smuggling routes to prevent the spread of H5N1 bird flu virus. Though H5N1 transmission between people is weak, it poses a risk if it gets mixed with the now dominant H1N1 swine flu virus. The hybrid could be deadly and easily transmissible among people, they warned. Russian Prime Minister Vladimir Putin allowed a paper mill near Lake Baikal in Siberia to reopen. The Soviet-era plant was mothballed in 2008 amid a row over polluting the world’s largest freshwater lake with rich biodiversity. Greenp-eace said it would urge President Dmitry Medvedev to overturn Putin’s decision. Ukraine adopted a new law requiring the mandatory labelling of all products containing gmos. Earlier only products containing more than 0.9 per cent of gmos needed labelling. Irish dairy industries’ association has urged the government to scrap a plan to impose a carbon tax, US $21 a tonne of carbon, on fossil fuel, as it would inflate the cost of domestically produced food products, giving an edge to imported goods. Inuits from Canada and Greenland sued the European Commission over its ban on seal products since 2009. They said the ban is influenced by animal rights extremists; seal hunt is humane and sustainable. Brazil launched the world’s first ethanol-fuelled power plant in a bid to boost its clean power generation. It has earlier mandated 20 per cent ethanol in petrol. Critics say biofuel undermines food security. Days after US environmental protection agency approved a mountain-top coal mine, a dozen scientists from the country called for a ban saying the practice has irreversible impacts on rivers and human health.